As those of you who read me regularly know, Harrison played 6th grade football this fall. Two things happened as a result: 1) He learned to love the game. 2) We all got into the act. And, the Jets, one of our local teams, (people, this is New York, why have just one of ANYTHING!!!) have continued the momentum long after Harrison’s season wrapped. The Jets have made it all the way to the League Finals. Just don’t ask me which League, I know there are two, but beyond that- you got me. Anyway, in honor of the Jets extraordinary achievement, I decided that I had to come up with some pretty fabulous “green” food for the game on Sunday night. Green Eggs and Ham was a non-starter…so was a salad…who eats salad watching a football game…but Salsa Verde…hmmm, I could work with the Mexican thing. I mean what is better than football and Mexican food? Seriously. There is nothing better in my book. So for Gang Green- here’s hoping you go all the way. We will be cheering you on Sunday night, and eating this in your honor. I’d say stop by for a bite after the game- but this is so good, there won’t be anything left. *** Postscript: My husband has just informed me that there is only one League- there are two conferences…oops! Apologies! Oh well, you learn something new everyday! 1. Preheat the oven to 350. 2. In a large pot or deep-sided sauté pan, heat the olive oil over medium heat. Add the onions and cook for 2 minutes, stirring occasionally. Add the garlic and cumin, stir to combine and continue cooking for another 2-3 minutes, or until onions are soft. Add the chicken, stir to combine and cook for another minute or two. Add cilantro, stir and remove chicken mixture from heat and set aside. 3. In a medium saucepan, bring 2 c of chicken stock to a simmer. 4. Meanwhile, in a small saucepan, bring the remaining ½ c of stock to a boil and immediately whisk in ¼ c flour. Turn of heat and continue whisking until smooth and thick. 5. Add the chicken and flour mixture to the pan with the simmering stock. Continue to whisk and simmer until the flour mixture is fully incorporated and the chicken stock thickens. Turn off heat and whisk in the sour cream and the cans of green chilies. Season with salt and pepper. 6. Add the chicken mixture to the sauce and stir to combine. 7. Using a large casserole, cover the bottom with about ¼ cup of Salsa Verde. 9. When all the tortillas are filled and there is no room left in the casserole, cover the tortillas with the rest of the Salsa Verde and shredded cheddar. 10. Cover the casserole with tinfoil and bake for 35 minutes. Uncover the casserole and bake for 10 minutes more. 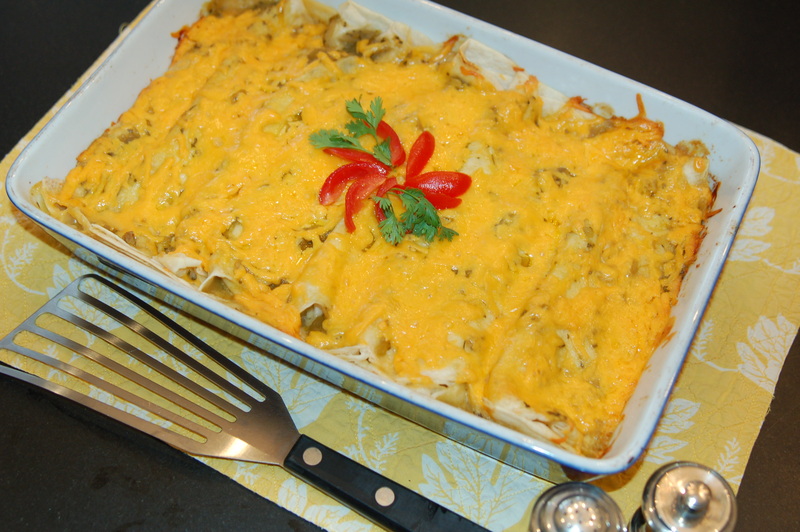 Let enchiladas rest for 10 minutes before serving. This entry was written by Caroline, posted on January 20, 2011 at 9:17 pm, filed under Chicken, comfort food, entertaining, good times, kid friendly. Bookmark the permalink. Follow any comments here with the RSS feed for this post. Post a comment or leave a trackback: Trackback URL. OMG CC this looks fabulous. Your sister will be trying this in our kitchen ASAP. ps, too bad about the Jest.